With the first half of 2017 behind us, I’m proud to announce that Christie’s is now the market leader for African and Oceanic art in Paris. 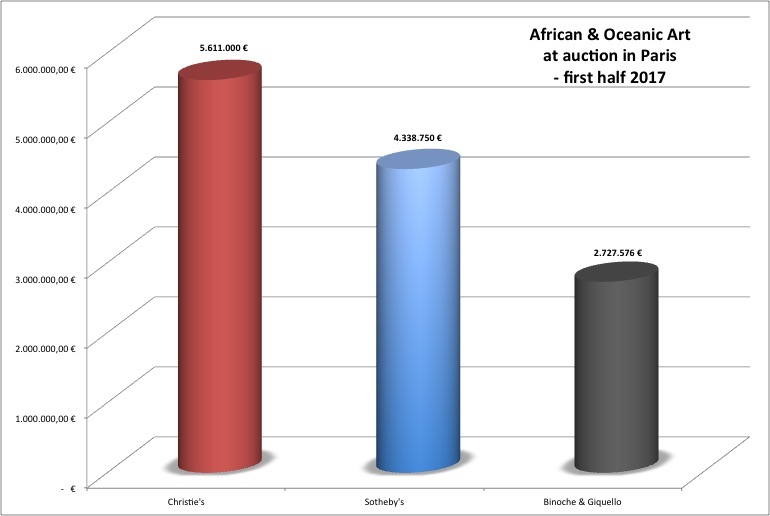 As the above graph shows we sold for more than 1 million euro worth of art more than our nearest competitor. Our innovative new auction calendar, the strengthening of our team (enter Victor Teodorescu), the company-wide support, the tightly curated selection, the experienced directorship of Susan Kloman and the presence of ‘the legend’ Pierre Amrouche in our team all steered us towards this goal. And, it is our intention and strong ambition to maintain this position onwards. For now, I can’t reveal much about the second half of the year, but I promise you even more fireworks. As we say in our office, team work makes the dream work! But for now, happy holidays everybody*!! I hope to see you in Paris for Parcours des Mondes during which we will already preview some masterpieces of our fall sales at our Paris headquarters. This entry was posted in Auctions, News on July 14, 2017 by admin. 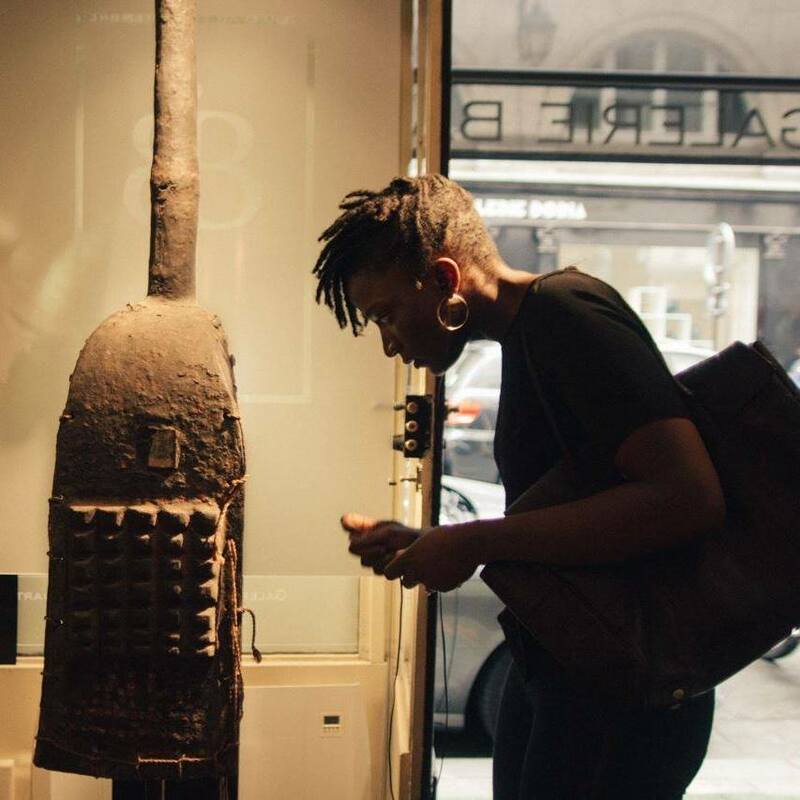 One of the rising stars of the online African art community is Adenike Cosgrove, who’s website ÌMỌ̀ DÁRA has quickly become one of the most inspiring online resources for a frequent fix of interesting African art related stories and content. As Cosgrove has been featuring more and more interviews on her site, while herself discretely staying out of the limelight, I thought it would be interesting to change the roles for once and interview the interviewer..
BC: Dear Adenike, thanks for agreeing to be interviewed. To start, could you tell us something about yourself? I’m a Nigerian, born in Tokyo, raised in Hong Kong and Lagos, and currently residing in London! I’ve been fortunate enough to have travelled extensively – I’ve seen many wonderful cultures, and as such have been exposed to art, history and people from over the world. Despite this though, I’ve always been drawn back to Nigeria. I’ve always wanted to know more about my history and the Yoruba culture of my parents. About five years ago, during a trip back to Nigeria, my Dad took me to an art village in Abuja – you know, the type that’s full of art for tourists. Not knowing much about classic African art at the time, I bought what I thought were a pair of antique Benin bronze leopard aquamaniles. At about $600 each, they weren’t cheap and the vendor told me they were ‘special’ and that I was the first person he’d shown them to because ‘I look like someone that appreciates art’. Convinced at the time I had purchased authentic gems, I smuggled them in my suitcase and snuck them out of Nigeria. Boy was I wrong! Back in London, I wanted to learn all I could about the pieces. I’m fortunate to have access to the British Library here, I started reading. I visited the British Museum and entered the Africa section for the first time. I compared my leopards to those at museums, in auction catalogues, and in books and very soon realised that what I’d bought were in fact fakes! This revelation led to the idea for ÌMỌ̀ DÁRA, a resource that collectors can use to better understand the distinguishing features of different classic African pieces, in the hope that they might avoid acquiring fakes themselves. BC: I remember ÌMỌ̀ DÁRA in its early days was mainly about selecting a specific object type and highlighting its distinguishing features. I think your bullet-point style is a clever and efficient way to list these, especially in the online world, where people’s attention span is much shorter. From its start, the website was very well designed, simple and clean, and easily brownsable. How did you create it? As mentioned, I spent every spare moment reading books on classic African art to increase my knowledge. I soon realised that I had amassed a wealth of information that didn’t seem to be easily accessible online. I wanted to create a platform where I could share the information gathered in a browsable, accessible, and easily digestible format. I wanted the platform to cater to established collectors looking to learn more about the pieces in their collections, but I also wanted it to capture the interest of a new, younger audience. And thus, ÌMỌ̀ DÁRA was born. But to be honest, ÌMỌ̀ DÁRA wouldn’t be here if not for my husband, Jonathan Cosgrove. He’s an awesome web developer that tends to focus on minimalist designs. When I told him about what I wanted to create, he had the foresight to know that the website should focus on the visuals, that the art should take centre stage while allowing a concise way to display the information related to each piece – hence the bullet point lists of ‘Distinguishing Features’. He also knew that having a mobile version of the site would be important, so that those in the field, wanting to learn about pieces that they saw at museums and at art shows could use the platform on the go. BC: While focussing on the ‘distinguishing features’ page in its early days, ÌMỌ̀ DÁRA quickly expanded its content and you started addressing and exploring other topics as well. How did this happen? In doing the research, speaking with collectors at fairs, and visiting a number of different galleries, I very quickly realised that ‘learning’ is about more than just reading books. It’s about learning from the experience of others and visiting museums and fairs to see and handle as much art as possible. So we decided to start educating collectors about what it means to collect African art by interviewing collectors at different stages of the collecting journey, through a magazine style format. We did this also because there has been so much talk lately about the ‘dying African art market’ and that there are no new collectors in the field. The interviews we’ve done has shown this not to be true. Yes, young collectors may not be spending tens of thousands of Pounds, Dollars or Euros on art but the field has a role to play in nurturing these future collectors and getting them excited about the wealth of art available at all price ranges. We’ve also started writing about museum exhibitions and art fairs which we feel present opportunities for collectors to learn more about African art. In addition, we’re also profiling contemporary artists that are influenced by the art of Africa. Finally, we have now also created a platform that collectors can use to manage their collections online. BC: I’m delighted to see what an ambitious venture ÌMỌ̀ DÁRA has quickly become. As I know from personal experience managing such an active website is a very time-consuming endavour; is it your fulltime occupation ? In one of the recent interviews we published on ÌMỌ̀ DÁRA, I spoke with Dr. Polly Nooter Roberts, consulting curator of African art at LACMA. She said something that resonated with me, “whatever you do in life requires hard work and passion, that we have a commitment to pick something we’re most in love with”. Even though, at this point in time, I have a full-time job in the cybersecurity industry, ever since that day in the market in Abuja, I’ve fallen in love with African art. So much in love that I don’t mind working two jobs, much to the chagrin of my husband! But in all seriousness he sees the pure joy on my face when I see an amazing piece of African art. I’ve never felt anything like this before and I want to share this feeling with more people globally. BC: While ÌMỌ̀ DÁRA happens online only for now, do you think you will ever organize events in the real world as well ? We started online because that seems now to be where people start in their discovery of African art. For too long, galleries have relied only on foot traffic but that model alone is not sustainable, or at least not enough to attract the next generation of African art collectors. We need to be where they are… we need to be online. That being said, I like the idea of a multi-channel experience: web, social, mobile, and physical interactions. I would love for one day to be in a position to curate guided tours of museums, galleries, libraries, and private collections. To have collectors collaborate with curators, dealers, academics, and enthusiasts on all things African art. Who knows, you may see an ÌMỌ̀ DÁRA sponsored event soon. 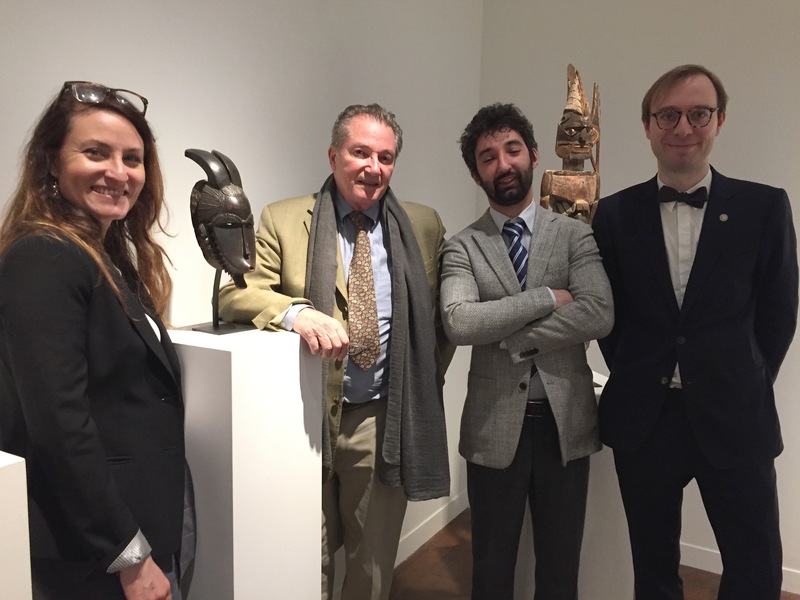 BC: While Paris and Brussels are now the central hubs for the African art market, London (where you are based) once was an important epicenter as well – unfortunately not so much anymore. Do you have any explanations why this is so and do you think it will change again in the future ? Having a quick glimpse into our website analytics, figures show a significant interest from the United States, followed closely by the UK. France and Belgium do appear but they are not at the top which may or may not suggest a potential for change in the market, if not now then sometime in the future. Nigeria falls within the top five, which contrary to some perceptions, suggests interest in the origin country of many of these amazing pieces of art. This could be a change in the existing market or evidence of a new market. In addition, because of globalisation, people are more willing to make the effort to travel to the sources of quality African art pieces. As for potential changes in the future, nothing is static, time inevitably leads to change. Who knows where the new epicenter might be. BC: As a Nigerian, how do you feel about questions of repatriation ? This is a tough one. On the one hand African art is African! Africans should be able to appreciate the art of their ancestors. They should be able to have easy access to that art. If should be within reach of the next generation of artists that expand the definition of African art while maintaining a link to the past. However these are antiques. These are delicate materials that must be appropriately maintained. An example, last year I went to visit the National Museum in Lagos and on display were two Benin Ivory tusks. Beautiful things! But they were left exposed! No glass case, no temperature control, no equipment to ensure that a consistent atmosphere is maintained and preserved all year round – through the very humid rainy season and the dry Harmattan season. And as we know from the interview with restorer Anne-Catherine Kenis, the worst thing for ivory is humidity. The tucks were left exposed for anyone to touch or damage. That is my concern about returning pieces back to countries without the infrastructure to maintain them. Having spoken to our Nigerian museum guide, he was aware that the condition of the museum was less than adequate but explained lack of funding as the main reason. He himself was not receiving a salary for the tour but did it purely out of his love for the art and its history. But then again, if a piece has been illegally acquired from an institution in Africa then buyer beware! Africans are waking up to the value of their history. BC: To finish, which 3 books would you recommend to someone who wants to learn about African art, and why ? Another tough question Bruno because I think it depends on what type of art someone’s interested in – Africa’s huge and its art so so diverse, from the classic and naturalistic, to the raw and rough. What I can speak to are the books that I’ve enjoyed or learned the most from. I really enjoy books that not only have pretty pictures but also descriptions and context about the pieces within their pages. I especially like books that include the ethnic names of objects. I am personally really interested in Yoruba art. ‘Yoruba Art and Language: Seeking the African in African Art’ by Rowland Abiodun is a great resource that covers the art, language, and history of the Yoruba culture. It’s helping me brush up on my Yoruba too! Another great and very detailed book is ‘Central Nigeria Unmasked: Arts of the Benue River Valley’ by Marla C. Berns, Richard Fardon, and Sidney Littlefield Kasfir. This really is the bible of art from Central and East Nigeria. Reading this book opened my eyes to the beauty of masks and figures from the Mumuye, the Chamba, and the Jukun. Because of this book, I’ve also become more interested in exploring art from Cameroon. Books that I’d like to get my hands on are the volumes written by Leo Frobenius, ‘Und Afrika Sprach’, a four-volume account of his expedition to Nigeria in 1910–1912. The illustrations in the book are incredible and I imagine the content gives a glimpse into the early perceptions of Nigerian art discovered by Frobenius during his travels. Only thing is I’d have to brush up on my German first! There are also many great online resources that people can turn to. ÌMỌ̀ DÁRA (naturally), your blog, Tribal Index and Artkhade for insight into the auction results of various objects, and Facebook. The groups of collectors sharing information about pieces in their collections is so insightful. I love the willingness to share in this field. And as the saying goes, ‘sharing is caring’ – dear Adenike many thanks for this interview and keep up the good work! This entry was posted in Opinions on July 7, 2017 by admin.